Several aortic valve repair techniques have been used in children, including pericardial leaflet extension, commissural reconstruction, annuloplasty, sinus of Valsalva reduction, sinotubular junction remodeling, and even complete leaflet replacement using autologous pericardium. Aortic valve repair in the child allows for continuing growth and eliminates the need for anticoagulation. However, long-term results have been less than satisfactory, and residual lesions (eg, regurgitation, stenosis) are common. Despite evidence of stabilization of ventricular dimensions and improvement of functional classification in children following aortic valve repair, the residual lesions continue to progress, with increased regurgitant fraction and/or peak gradients across the left ventricular outflow tract; eventually, patients require reoperation and possible valve replacement. The role of valve repair in children as a curative or a temporizing measure remains incompletely defined. Nevertheless, aortic valve repair delays ultimate replacement until alternative valve replacement options can be offered to patients after completion of somatic growth, pregnancy and increased compliance with anticoagulation regimen. Mechanical valve prostheses are not ideal valve substitutes in children. Although the incidence of structural valve deterioration is negligible, these prostheses have significant limitations at the time of implant due to the lack of appropriately sized prostheses for small children and neonates. In addition, the absence of potential for growth can result in patient-prosthesis size mismatch as the child grows and may require re-replacement. Moreover, mechanical valves require lifetime anticoagulation with associated activity limitations, difficulties with future pregnancy, and a lifetime risk of thromboembolic and bleeding complications due to potential poor compliance with anticoagulation protocol. Homografts and bioprosthetic valves are also problematic in children. Although these biologic valves do not require anticoagulation, they do not allow growth, and their durability in the pediatric population is very limited due to the high risk of accelerated structural valve degeneration and early calcification. In addition, the availability of appropriate sized homografts and bioprostheses can be a problem. The Ross procedure using pulmonary autograft provides excellent hemodynamics flow characteristics, is capable of growth, and does not require anticoagulation. Despite several shortcomings of the Ross procedure, it has emerged as a popular choice for aortic valve replacement in infants and children. This review focuses on the role of the Ross procedure in the treatment of aortic valve disease in children and young adults. The procedure of replacing the aortic valve with the patient's own pulmonary valve and then using a pulmonary allograft to replace the pulmonary valve is commonly referred to as the Ross procedure. Lower, Stofer, and Shumway investigated the concept in 1960 using autotransplantation of the pulmonic valve into the descending thoracic aorta of dogs. Pillsbury and Shumway described autotransplantation into the aortic annulus in 1966. However, the first clinical application occurred 1 year later, as reported by Donald Ross in 1967 (see the image below). Since then, the operation has steadily gained acceptance, and the indications for the procedure have expanded. Pulmonary-valve autograft procedure for aortic valve replacement. Thorough knowledge of cardiac anatomy is required to perform the Ross procedure. In particular, an understanding the left coronary artery, the first septal branch of the left anterior descending artery, and their relationship to the aortic root and the right ventricular outflow tract is important (see the image below). During harvest of the pulmonary autograft, an appreciation of the subpulmonary conal musculature (ie, the thin muscular tube beneath the pulmonary valve) facilitates the dissection. Knowledge of the configuration of the left ventricular outflow tract and the relationship to the conduction system is important when enlargement of the left ventricular outflow tract is required (Ross-Konno procedure). 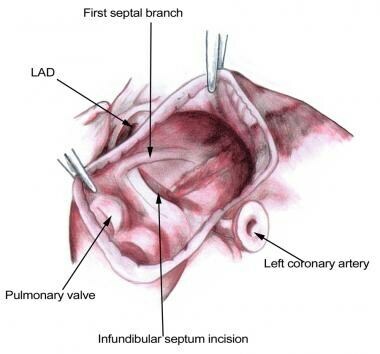 Excision of the pulmonary autograft to avoid injury to the underlying first septal branch. LAD = left anterior descending artery. The Ross operation is a technically demanding procedure, and the surgeon's experience with this operation and similar procedures affects the decision-making process. Patient factors that affect this process include the patient's age, lifestyle, and coexisting cardiac and noncardiac disease. Lower RR, Stofer RC, Shumway NE. Autotransplantation of the pulmonic valve into the aorta. J Thorac Cardiovasc Surg. 1960. 39(5):680-7. [Medline]. Pillsbury RC, Shumway NE. Replacement of the aortic valve with the autologous pulmonic valve. Surg Forum. 1966. 17:176-7. [Medline]. Ross DN. Replacement of aortic and mitral valves with a pulmonary autograft. Lancet. 1967 Nov 4. 2(7523):956-8. [Medline]. Oury JH, Hiro SP, Maxwell JM, et al. The Ross Procedure: current registry results. Ann Thorac Surg. 1998 Dec. 66(6 Suppl):S162-5. [Medline]. Weymann A, Dohmen PM, Grubitzsch H, Dushe S, Holinski S, Konertz W. Clinical experience with expanded use of the Ross procedure: a paradigm shift?. J Heart Valve Dis. 2010 May. 19(3):279-85. [Medline]. Stulak JM, Burkhart HM, Sundt TM 3rd, Connolly HM, Suri RM, Schaff HV, et al. Spectrum and outcome of reoperations after the Ross procedure. Circulation. 2010 Sep 21. 122(12):1153-8. [Medline]. Sievers HH, Stierle U, Charitos EI, Hanke T, Misfeld M, Matthias Bechtel JF, et al. Major adverse cardiac and cerebrovascular events after the Ross procedure: a report from the German-Dutch Ross Registry. Circulation. 2010 Sep 14. 122(11 Suppl):S216-23. [Medline]. Alsoufi B, Al-Halees Z, Manlhiot C, McCrindle BW, Kandeel M, Al-Joufan M, et al. Superior results following the Ross procedure in patients with congenital heart disease. J Heart Valve Dis. 2010 May. 19(3):269-77; discussion 278. [Medline]. David TE. Reoperations after the Ross procedure. Circulation. 2010 Sep 21. 122(12):1139-40. [Medline]. Zebele C, Chivasso P, Sedmakov C, et al. The Ross Operation in Children and Young Adults: 12-Year Results and Trends From the UK National Database. World J Pediatr Congenit Heart Surg. 2014 Jun 23. 5(3):406-412. [Medline]. Luciani GB, Lucchese G, Carotti A, et al. Two decades of experience with the Ross operation in neonates, infants and children from the Italian Paediatric Ross Registry. Heart. 2014 Dec 15. 100(24):1954-9. [Medline]. Pasquali SK, Cohen MS, Shera D, Wernovsky G, Spray TL, Marino BS. The relationship between neo-aortic root dilation, insufficiency, and reintervention following the Ross procedure in infants, children, and young adults. J Am Coll Cardiol. 2007 May 1. 49(17):1806-12. [Medline]. Alexiou C, McDonald A, Langley SM, et al. Aortic valve replacement in children: are mechanical prostheses a good option?. Eur J Cardiothorac Surg. 2000 Feb. 17(2):125-33. [Medline]. Alsoufi B, Al-Halees Z, Manlhiot C, et al. Mechanical valves versus Ross procedure for aortic valve replacement in children: Propensity-adjusted comparison of long-term outcomes. J Thorac Cardiovasc Surg. 2009. Al-Halees Z, Pieters F, Qadoura F, et al. The Ross procedure is the procedure of choice for congenital aortic valve disease. J Thorac Cardiovasc Surg. 2002. 123:437-41. [Medline]. Albertucci M, Karp RB. Aortic valvular allografts and pulmonary autografts. Emunds LH, ed. Cardiac Surgery in the Adult. New York, NY: McGraw-Hill; 1997. 911. Alsoufi B, Karamlou T, Bradley T, Williams WG, Van Arsdell GS, Coles JG. Short and midterm results of aortic valve cusp extension in the treatment of children with congenital aortic valve disease. Ann Thorac Surg. 2006 Oct. 82(4):1292-9; discussion 1300. [Medline]. Berger S, Dhala A, Friedberg DZ. Sudden cardiac death in infants, children, and adolescents. Pediatr Clin North Am. 1999 Apr. 46(2):221-34. [Medline]. Brown JW, Ruzmetov M, Vijay P, et al. Clinical outcomes and indicators of normalization of left ventricular dimensions after Ross procedure in children. Semin Thorac Cardiovasc Surg. 2001. 13:28-34. [Medline]. Brown JW, Ruzmetov M, Vijay P, et al. Surgery for aortic stenosis in children: a 40-year experience. Ann Thorac Surg. 2003. 76:1398-1411. [Medline]. Chambers JC, Somerville J, Stone S, Ross DN. Pulmonary autograft procedure for aortic valve disease: long-term results of the pioneer series. Circulation. 1997 Oct 7. 96(7):2206-14. [Medline]. David TE, Omran A, Ivanov J, et al. Dilation of the pulmonary autograft after the Ross procedure. J Thorac Cardiovasc Surg. 2000. 119:210-20. [Medline]. Elkins RC, Knott-Craig CJ, Ward KE, Lane MM. The Ross operation in children: 10-year experience. Ann Thorac Surg. 1998 Feb. 65(2):496-502. [Medline]. Elkins RC, Santangelo K, Randolph JD, et al. Pulmonary autograft replacement in children. The ideal solution?. Ann Surg. 1992 Sep. 216(3):363-70; discussion 370-1. [Medline]. Elkins RC, Thompson DM, Lane MM, Elkins CC, Peyton MD. Ross operation: 16-year experience. J Thorac Cardiovasc Surg. 2008 Sep. 136(3):623-30, 630.e1-5. [Medline]. Fedderly RT. Left ventricular outflow obstruction. Pediatr Clin North Am. 1999 Apr. 46(2):369-84. [Medline]. Gerosa G, McKay R, Davies J, Ross DN. Comparison of the aortic homograft and the pulmonary autograft for aortic valve or root replacement in children. J Thorac Cardiovasc Surg. 1991 Jul. 102(1):51-60; discussion 60-1. [Medline]. Hazekamp MG, Grotenhuis HB, Schoof PH, et al. Results of the Ross operation in a pediatric population. Eur J Cardiothorac Surg. 2005. 27:975-79. [Medline]. Hraska V, Krajci M, Haun C, et al. Ross and Ross-Konno procedure in children and adolescents: mid-term results. Eur J Cardiothorac Surg. 2004. 25:742-47. [Medline]. Jahangiri M, Nicholson IA, del Nido PJ, et al. Surgical management of complex and tunnel-like subaortic stenosis. Eur J Cardiothorac Surg. 2000. 17:637-42. [Medline]. Joyce F, Tingleff J, Pettersson G. Changing indications for the Ross operation. Semin Thorac Cardiovasc Surg. 1996 Oct. 8(4):336-44. [Medline]. Kalangos A, Beghetti M, Baldovinos A, et al. Aortic valve repair by cusp extension with the use of fresh autologous pericardium in children with rheumatic aortic insufficiency. J Thorac Cardiovasc Surg. 1999 Aug. 118(2):225-36. [Medline]. Karamlou T, Jang K, Williams WG, Caldarone CA, Van Arsdell G, Coles JG. Outcomes and associated risk factors for aortic valve replacement in 160 children: a competing-risks analysis. Circulation. 2005 Nov 29. 112(22):3462-9. [Medline]. Khwaja S, Nigro JJ, Starnes VA. The Ross procedure is an ideal aortic valve replacement operation for the teen patient. Semin Thorac Cardiovasc Surg Pediatr Card Surg Annu. 2005. 173-5. [Medline]. Konno S, Imai Y, Iida Y, et al. A new method for prosthetic valve replacement in congenital aortic stenosis associated with hypoplasia of the aortic valve ring. J Thorac Cardiovasc Surg. 1975 Nov. 70(5):909-17. [Medline]. Kouchoukos NT, Davila-Roman VG, Spray TL, et al. Replacement of the aortic root with a pulmonary autograft in children and young adults with aortic-valve disease. N Engl J Med. 1994 Jan 6. 330(1):1-6. [Medline]. Kouchoukos NT, Masetti P, Nickerson NJ, et al. The Ross procedure: long-term clinical and echocardiographic follow-up. Ann Thorac Surg. 2004. 78:773-81. [Medline]. Latson LA. Valvar, supravalvar, and fibromuscular subvalvar. Garson A Jr, Bricker JT, Fisher DJ, Neish SR, eds. The Scienceand Practice of Pediatric Cardiology. 2nd ed. Philadelphia, PA: Lippincott Williams & Wilkins; 1998. 1257. Luciani GB, Barozzi L, Tomezzoli A, et al. Bicuspid aortic valve disease and pulmonary autograft root dilatation after the Ross procedure: a clinicopathologic study. J Thorac Cardiovasc Surg. 2001. 122:74-9. [Medline]. Luciani GB, Favaro A, Casali G, et al. Reoperations for aortic aneurysm after the Ross procedure. J Heart Valve Dis. 2005. 14:766-72. [Medline]. Luciani GB, Favaro A, Casali G, et al. Ross operation in the young: a ten-year experience. Ann Thorac Surg. 2005. 80:2271-7. [Medline]. Lupinetti FM, Duncan BW, Lewin M, et al. Comparison of autograft and allograft aortic valve replacement in children. J Thorac Cardiovasc Surg. 2003. 126:240-6. [Medline]. Matsuki O, Okita Y, Almeida RS, et al. Two decades' experience with aortic valve replacement with pulmonary autograft. J Thorac Cardiovasc Surg. 1988 Apr. 95(4):705-11. [Medline]. Muresian H. The Ross procedure: new insights into the surgical anatomy. Ann Thorac Surg. 2006. 81:495-501. [Medline]. Nordmeyer J, Coats L, Bonhoeffer P. Current experience with percutaneous pulmonary valve implantation. Semin Thorac Cardiovasc Surg. 2006 Summer. 18(2):122-5. [Medline]. Ohye RG, Gomez CA, Ohye BJ, et al. The Ross/Konno procedure in neonates and infants: intermediate-term survival and autograft function. Ann Thorac Surg. 2001. 72:823-30. [Medline]. Oswalt JD, Dewan SJ, Mueller MC, Nelson S. Highlights of a ten-year experience with the Ross procedure. Ann Thorac Surg. 2001. 71:S332-S335. [Medline]. Oury JH, Maxwell M. Cox JL, Sundt TM III, eds. An appraisal of the Ross procedure: goals and technical guidelines. In: . Operative Techniques in Cardiac & Thoracic Surgery: A Comparative Atlas. Philadelphia, PA: WB Saunders; 1997. Vol 2: 289. Raja SG, Pozzi M. Growth of pulmonary autograft after Ross operation in pediatric patients. Asian Cardiovasc Thorac Ann. 2004. 12:285-90. [Medline]. Raja SG, Pozzi M. Ross operation in children and young adults: the Alder Hey case series. BMC Cardiovasc Disord. 2004. 4:3. [Medline]. Reddy VM, McElhinney DB, Phoon CK, et al. Geometric mismatch of pulmonary and aortic anuli in children undergoing the Ross procedure: implications for surgical management and autograft valve function. J Thorac Cardiovasc Surg. 1998. 115:1255-62. [Medline]. Ross D, Jackson M, Davies J. Pulmonary autograft aortic valve replacement: long-term results. J Card Surg. 1991 Dec. 6(4 Suppl):529-33. [Medline]. Ross D, Jackson M, Davies J. The pulmonary autograft--a permanent aortic valve. Eur J Cardiothorac Surg. 1992. 6(3):113-6; discussion 117. [Medline]. Rubay JE, Raphael D, Sluysmans T, et al. Aortic valve replacement with allograft/autograft: subcoronary versus intraluminal cylinder or root. Ann Thorac Surg. 1995. 60:S78-S82. [Medline]. Ruzmetov M, Vijay P, Rodefeld MD, et al. Evolution of aortic valve replacement in children: A single center experience. Int J Cardiol. 2005 Dec 21. [Medline]. Slater M, Shen I, Welke K, et al. Modification to the Ross procedure to prevent autograft dilatation. Semin Thorac Cardiovasc Surg Pediatr Card Surg Annu. 2005. 181-4. [Medline]. Starnes VA, Luciani GB, Wells WJ, Allen RB, Lewis AB. Aortic root replacement with the pulmonary autograft in children with complex left heart obstruction. Ann Thorac Surg. 1996 Aug. 62(2):442-8; discussion 448-9. [Medline]. Starnes VA, Luciani GB, Wells WJ, et al. Aortic root replacement with the pulmonary autograft in children with complex left heart obstruction. Ann Thorac Surg. 1996 Aug. 62(2):442-8; discussion 448-9. [Medline]. Sundt TM, Moon MR, Xu H. Reoperation for dilatation of the pulmonary autograft after the Ross procedure. J Thorac Cardiovasc Surg. 2001. 122:1249-52. [Medline]. Svensson G, Aljassim O, Svensson SE, et al. Anatomical mismatch of the pulmonary autograft in the aortic root may be the cause of early aortic insufficiency after the Ross procedure. Eur J Cardiothorac Surg. 2002. 21:1049-54. [Medline]. Takkenberg JJ, Dossche KM, Hazekamp MG, et al. Report of the Dutch experience with the Ross procedure in 343 patients. Eur J Cardiothorac Surg. 2002. 22:70-7. [Medline]. Takkenberg JJ, van Herwerden LA, Galema TW, et al. Serial echocardiographic assessment of neo-aortic regurgitation and root dimensions after the modified Ross procedure. J Heart Valve Dis. 2006. 15:100-6. [Medline]. Takkenberg JJ, Zondervan PE, van Herwerden LA. Progressive pulmonary autograft root dilatation and failure after Ross procedure. Ann Thorac Surg. 1999. 67:551-3. [Medline]. Tweddell JS, Pelech AN, Frommelt PC, Jaquiss RD, Hoffman GM, Mussatto KA. Complex aortic valve repair as a durable and effective alternative to valve replacement in children with aortic valve disease. J Thorac Cardiovasc Surg. 2005 Mar. 129(3):551-8. [Medline]. Vida VL, Rubino M, Bottio T, et al. Performance of the pulmonary autograft in four infants after the Ross procedure. Pediatr Cardiol. 2005. 26:797-800. [Medline]. Williams IA, Quaegebeur JM, Hsu DT, et al. Ross procedure in infants and toddlers followed into childhood. Circulation. 2005. 112:I390-5. [Medline]. Zeevi B, Keane JF, Castaneda AR, et al. Neonatal critical valvar aortic stenosis. A comparison of surgical and balloon dilation therapy. Circulation. 1989 Oct. 80(4):831-9. [Medline]. The pulmonary root is dissected out to the bifurcation by taking care to identify the left main coronary artery (LCA). Ao = aorta; PA = pulmonary artery; RCA = right coronary artery; SVC = superior vena cava. The infundibulum is incised 1-1.5 cm proximal to the leaflets of the pulmonary valve. Placement of the pulmonary autograft into the aortic position with polytetrafluoroethylene (Teflon; DuPont, Wilmington, DE) felt reinforcement. Placement of the pulmonary homograft into the pulmonary position. The left ventricular incision to enlarge the outflow tract during a Ross-Konno procedure. LV = left ventricle; RV = right ventricle. A polyethylene terephthalate (Dacron; DuPont, Wilmington, DE) patch is used to widen the left ventricular outflow tract (LVOT) in the Ross-Konno procedure.